This somewhat cheesy video from the late 1930s catalogues the tourist attractions of the city. It’s a pretty thorough survey, and there are a lot of great clips included. The Bay Bridge had only recently been built. At least the narrator can pronounce Kearny (rhymes with “carny” not “gurney’). 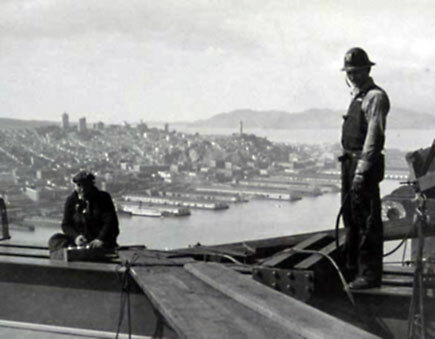 Emperor Norton had mandated a bridge connecting San Francisco, Yerba Buena Island, and Oakland back in the 1870s, but the bridge was not actually constructed until the 1930s as part of an economic stimulus program. In the early years the lower deck was used for train travel (a kind of proto-BART system). Today it’s part of one of the nation’s most nightmarish commutes, and as the new bridge adds no additional lanes this will not change. Because the Bay Area has an inadequate public transit system, it will be difficult to reduce auto traffic over the congested span. It’s too bad that current stimulus money is being put into a high-speed rail system through the central valley rather than into local urban transit that might actual get some people off the roads. This seven-minute film taken from the front of a San Francisco streetcar going the length of Market Street toward the Ferry Building is said to have been shot four days before the earthquake and fire of 1906, and to have survived because it was sent by train to New York for processing before the quake. Virtually all of the buildings shown (except the Ferry Building itself) were destroyed in the quake. The street scene is lively and chaotic, and many details are fascinating. PRESIDIO OF SAN FRANCISCO, 1887. This photograph was taken facing west and shows the Presidio Boulevard approach to the Post. The trees, planted in 1882 when Major General Irwin McDowell was Commander of the Western Department, today cover the hillsides. This 1914 video shows opium paraphernalia being burnt in what is now the Civic Center area. At the time the area had not yet been rebuilt following the ’06 earthquake (because voters would not pass bonds for funding the project because of the corruption of city leaders), but here you can see the new city hall under construction. The burning was associated with anti-Chinese sentiment. But the opium habit had been acquired by the Chinese when it was forced on them by the English in the Opium Wars in the mid-nineteenth century. This photo was taken in 1949 by San Francisco Chronicle photographer Barney Peterson. It was discovered by the Sparkletack blogger Richard Miller’s aunt among his grandfather’s archives. The photo is copyright the Chronicle, but I hope they won’t mind my posting this small version; the image links to the Sparkletack post. This sheet music cover dates from 1917. My publishing company used to occupy the entire first floor of the tower portion of the Call Building, the tallest building, I think, to survive the earthquake. The pool has some limitations. A few posters somewhat overwhelm the rest, and there are quite a few more pictures of someone named Leo than I really need. While the pool is fun to browse, it is very difficult to find anything in particular. I think the pool should be subdivided by decade, subject, or neighborhood. For more click on the screenshot below. Fort Point, at the south end of the Golden Gate Bridge, figures prominently in the Hitchcock film Vertigo. It is here where Kim Novak plunges off the fort into the water and is saved by Jimmy Stewart. The story is told — I don’t know if it is true or not, although it sounds plausible — that Novak and Hitchcock squabbled throughout the filming of the movie. Novak, it is said, constantly complained that her wardrobe was not glamorous enough. In the filming of this scene Hitchcock exacted his reverge. Claiming to be dissatisfied with the first couple of dozen takes, he made Novak enter the chilly water 25 times. Eadweard Muybridge produced two panoramas of the city. This one, made in January 1877 (the same year he produced photographic evidence that a trotting horse may lift all four hooves off the ground), was shot from the Mark Hopkins Mansion at California and Mason. Muybridge used 13 different cameras to make the image. At America Hurrah you can click the panorama thumbnails to see larger versions. UPDATE: The American Hurrah link has gone bad. One place you can still find at least a portion of a larger version is cameraplex. (There the first panorama is dated to 1878.) Below is a detail. Muybridge, San Francisco panorama, detail, ca 1877-78. This great map from the 1890s shows creeks in blue and marshes in green, with modern landfill in magenta. A larger version is at the Oakland Museum of California site. The U.S. Geological Survey Photographic Library includes 301 historic photos of the great April 18, 1906, San Francisco earthquake and its immediate aftermath. Shown is a view of the fiery city from Golden Gate Park. I’ve always enjoyed Orson Wells’s The Lady from Shanghai (1948). It was shot in San Francisco and Sausalito (and L.A.). Here are a few images, taken from the excellent site Film in America. At that site there are more images and commentary. I’ve taken the liberty of adjusting the tone of the images for clarity and photographic quality. A couple of days ago I was talking about the so-called Summer of Love as a media concoction. To repeat, the flowers were already beginning to wilt by that celebrated summer. To indicate how short-lived the movement really was, recall that by October residents of the Haight were commemorating “The Death of the Hippie” in a mock funeral. PBS’s American Experience has a brief video clip of the event (click the image to visit the site). Like all successful media constructions, the Summer of Love had a strong commercial aspect. B in the D, bellbottom sentiments were used to peddle Coca Cola. Today, the De Young Museum is pretending that the cliched commercial graphic designs of “psychedelic” artist Peter Max are fine art. Some people don’t realize that cable cars were at one time a working transit system in San Francisco and not just an amusement ride for tourists. In fact, when I first came to the city I used a cable car for one leg of my commute. The cars cost the same as buses then. Click on the detail below to see a full map of San Francisco cable car lines in 1893. The original could be better quality. I played with levels and curves to make this detail a bit more legible. The San Francisco Museum and Historical Society in putting together an encyclopedia of the city. Right now there isn’t much up, but if they follow through with this ambitious project it should end up being a helpful resource. It’s too bad there’s no feed so that one could be alerted of new entries. Right now the only way to find new items, as far as I can see, would be to scroll through the alphabet — hardly a solution that will encourage return visits.